The watch replica watches pointer is like a human hand, the earliest watch on the pointer looks like this, in addition treplica watches uk o the role of the pointer also decorative features, whether replica watches uk material or shape, as the watch evolve course of replica rolex development, the watch evolved too much Types, styles, specifications and craftsmanship. Come back to class to see what's new. Old Sailors Never Die…They Just Get a Little Dinghy – that was one of my Dad’s favorites, back when those sayings were popular. He wasn’t really a jokester, but he enjoyed lots of little things, like telling stories and hearing stories told about him – mostly sailing stories. His memory doesn’t help him recall everything lately, but he’s been comfortable and happy. Sometimes he is concerned because he would like to solve some problem out there, but there isn’t much he can do now. He tries to work out how to find someplace to stay, or how he could make some money. Today he said something about trying to improve the wheelchair. I asked him whether he wasn’t the one who designed the centerboard lift system that the members used at Sequoyah Yacht Club to store their boats above the water (instead of having to pull them out after the weekly races), but he said that he doesn’t remember. He designed some other sailing solutions like a way to determine the depth of the water at the boat ramp, and even submitted some to a national sailing magazine (probably Sailing World), which published at least two. He designed a keel guide for helping to load the retractable-keel Catalina 22s onto their trailers, and he loved to design mast-raising systems for larger boats. I remember staying up late one night at the old “boat yard,” as he built some sturdy, wooden steps so that potential buyers could step up alongside a soon-to-be-displayed boat on a trailer – probably a Catalina 22. The Boat Show would be the next day and so when it was about time to head for home, he started designing and building those steps. I would probably have been too young to drive, and had tagged along with my dad to work that day. I was an unofficial helper, and he probably asked me to hold this, or hand him that, which I did, and he did the hard part. We were in the very small building which housed the “office” and “shop,” at the boat yard on Latimer Court, behind Burkhart’s Marine. Burkhart’s owners, Art and Ruth Burkhart Obermire, sold marine hardware and rented us the space in the back. 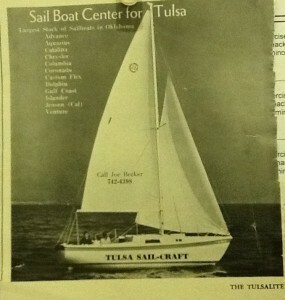 Tulsa Sail-Craft would have two more locations after, and had occupied at least one rental space and our backyard before this one, where my dad sold boats in the early 1970’s. My grandfather (and my sisters probably) helped sometimes, and there were a few paid employees, too. Dwayne Nelson told me that he had worked for TSC when it was on Latimer. We visited after the memorial service for his dad, Charlie Nelson, who had taught our sailing school later. Actually, I had been on the payroll earlier, as well. My sister and I would assemble the sail rigs for the Dolphins that would arrive at our house by the dozen or so, fastening the sails to the spars, and then the spars to the masts, and adding the main sheet and halyard to each rig and binding the long rig together by a chain of slip knots. 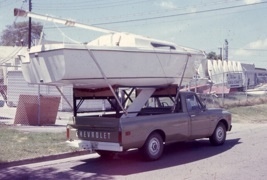 The photo that shows a newly-arrived Catalina 22 loaded on the back of a pickup truck, also shows some of the Dolphins leaning against Burkhart’s. If I ask my dad about all of this tomorrow, though, I’m not sure he’ll feel like discussing it. He was feeling very tired tonight. Posted on Friday, May 31st, 2013 at 11:31 pm	and is filed under Conversation, Family. You can follow any responses to this entry through the RSS 2.0 feed. Both comments and pings are currently closed. Very touching, sweet article, Barbara. Loved it! Love the article Barbara and the picture of the Catalina on the pickup. Rex says keep them coming. Such a great article Barbara! You remember so many details from many decades ago – it’s amazing. I do remember assembling the sail rigs. Those were hard on our hands! Thanks for these love letters to Daddy.